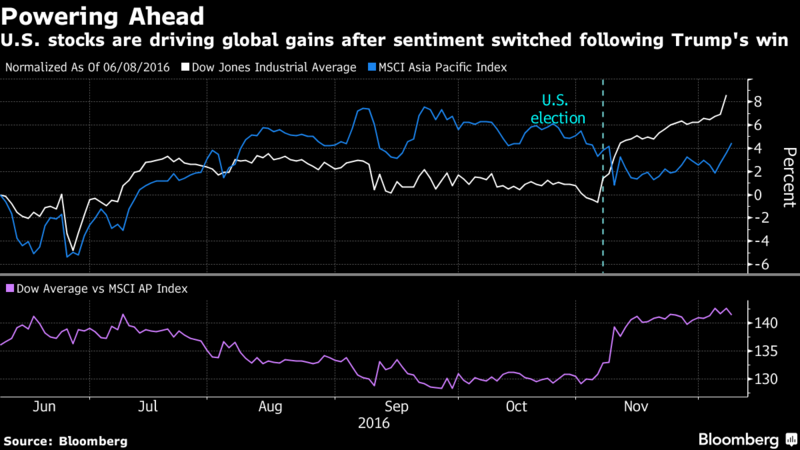 Fresh U.S. equity records bolstered Asian and European stocks, while bond yields declined before policy decisions from the world’s two biggest central banks. The Stoxx Europe 600 Index climbed for a fourth day after the MSCI Asia-Pacific Index rose the most in almost a month and Japan’s Topix Index closed at its highest this year. The euro and the yen extended gains with gold before Thursday’s European Central Bank meeting, amid mounting speculation policy makers will prolong their asset-buying program. The New Zealand dollar and South Korea’s won strengthened. Oil held below $50 a barrel after a surge in U.S. stockpiles. Expectations ECB chief Mario Draghi will prolong the bank’s 80 billion euros ($86 billion) a month of bond purchases beyond March provided a shot in the arm for U.S. equities, which had been struggling to extend the rally ignited by Donald Trump’s unexpected election win a month ago. Both the S&P 500 Index and the Dow Jones Industrial Average rose to records Wednesday. Odds on the Federal Reserve raising interest rates next week remain at 100 percent, according to Fed funds futures. China’s exports gained in November, snapping a seven-month losing streak, while imports jumped the most in two years, data showed Thursday. Final third-quarter data showed Japan’s economy expanded an annualized 1.3 percent, less than the rate of 2.3 percent predicted in a Bloomberg survey of economists. The MSCI Asia Pacific Index climbed 1.4 percent, rising for a third day. Japan’s Topix index gained 1.5 percent. Similar-maturity New Zealand debt yielded 3.18 percent, down five basis points.